Italy: Rome, Temple of Antoninus & Faustina. Possibly unfinished record drawing of a rectangular panel showing in relief a continuous frieze of winged lions with a vase emitting flames that has foliage and rosettes on either side. At one end is a vase with handles and vine decoration. You are here: CollectionsOnline / Italy: Rome, Temple of Antoninus & Faustina. 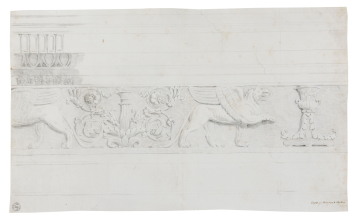 Possibly unfinished record drawing of a rectangular panel showing in relief a continuous frieze of winged lions with a vase emitting flames that has foliage and rosettes on either side. At one end is a vase with handles and vine decoration. This chalk drawing is characteristic of the style associated with Nicolas-François-David Lhuiller (d.1793), especially in the use of a hatched background and the technique of showing parts of the border, which is seen in several of his compositions. The chalk 'L' probably stands for Lhuiller and it appears on several drawings attributed to him. Part of this frieze is shown in G.L. Taylor & E. Cresy, The Architectural Antiquities of Rome, 2 vols., London, 1821, vol.I, p.64). There is another, more detailed, version in Adam vol.26/121.